The GW Instek GDM-8261A includes all the basic measurement functions that are required for engineers to handle design, development and testing jobs for electronic circuits or a companion precision measurement instrument in Calibration Laboratories. The basic measurement function include Voltage, Current, Resistance, Diode, Continuity, Frequency and Temperature. Remarkably, the current measurement functions covers a very wide range from 100uA to 10A for DC current (in 6 ranges) and from 1mA to 10A for AC current (in 5 ranges). 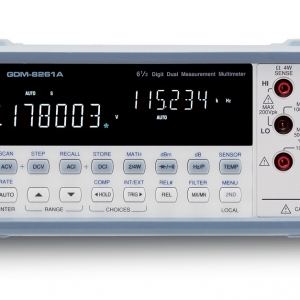 In addition, the GDM-8261A features 10 Math functions (dBm, dB, compare and other mathematical operations) to accommodate specific measurement requirements and complex measurement applications. Arbin’s Laboratory Battery Testing (LBT) series commercializes technology established during a 3?year ARPA-E project developing ultra?high precision testing systems. This product consists of independent potentiostat/galvanostat channels for testing batteries and other energy storage devices, and is intended to provide an economical solution for applications requiring high?precision measurements and fast data sampling. All Arbin testing systems come with a PC preloaded with our MITS Pro and Data Watcher software for creating test profiles, real?time data monitoring, and data plotting & analysis. The GW Instek Model PDH-1503D Precision Linear DC Power Supply is equipped with excellent transient recovery time, which can, in less than 40us, recover the output voltage to within 100mV of the previous voltage output when the current level changes from 10% to 100% of the full scale. Conventional power supplies do not have sufficient response speed to promptly respond to set voltage value once the set voltage is changed. The GW Instek Model PPH-1503D has a rise time of 0.2ms and a fall time of 0.3ms, which are 100 times faster than that of conventional power supplies. Therefore, the Model PPH-1503D can provide DUT with a stable output voltage even when DUT is operating under large transient current output.